With almost everything that contains a shred of automation relying on a microcontroller these days, it’s likely that you will own hundreds of microprocessors beside the obvious ones in your laptop or phone. Computing devices large and small have become such a part of the fabric of our lives that we cease to see them, the devices and machines they serve just work, and we get on with our lives. It is sometimes easy to forget then how recent an innovation they are. If you were born in the 1960s for example, computers would probably have been something spoken in terms of the Space Race or science fiction, and unless you were lucky you would have been a teenager before seeing one in front of you. Having seen such an explosive pace of development in a relatively short time, it has taken the historians and archivists a while to catch up. General museums have been slow to embrace the field, and specialist museums of computing are still relative infants in the heritage field. Computers lend themselves to interactivity, so this is an area in which the traditional static displays that work so well for anthropological artifacts or famous paintings do not work very well. 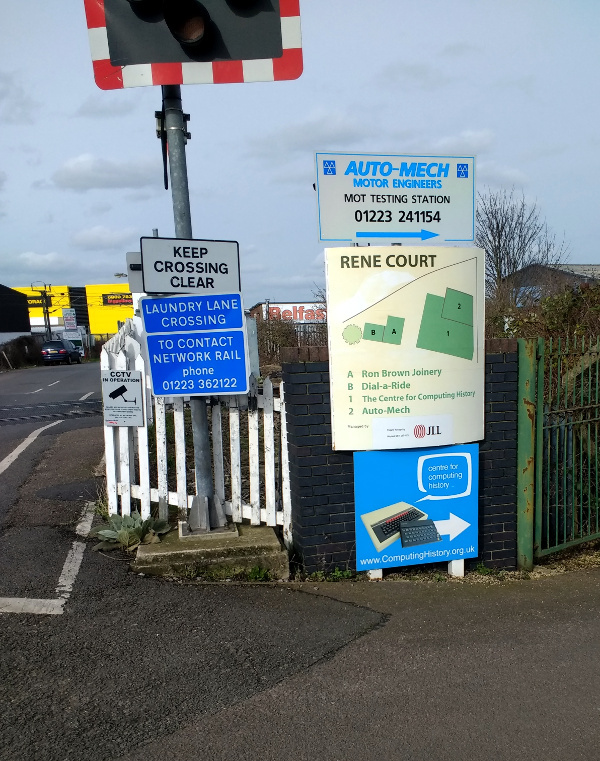 There’s the unobtrusive sign by the level crossing, Cambridge’s version of the black mailbox. 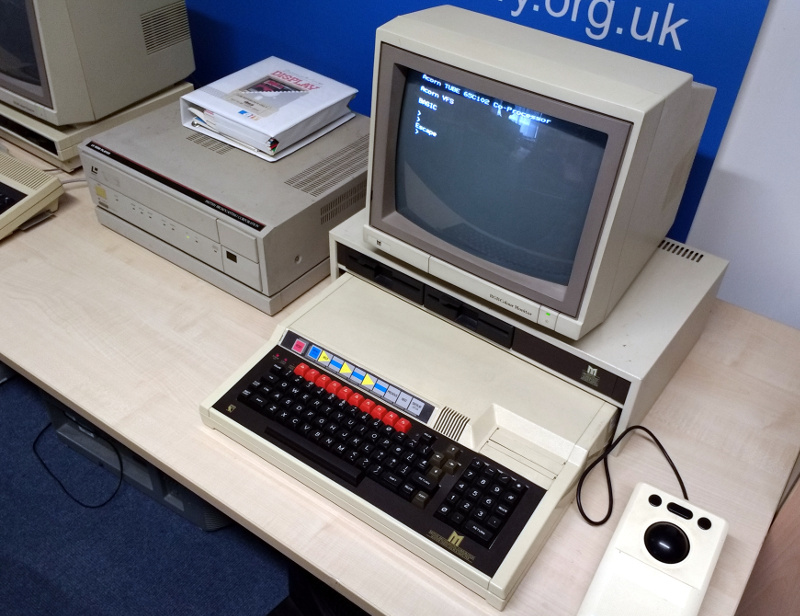 Tucked away next to a railway line behind an industrial estate in the city of Cambridge, UK, is one of the new breed of specialist computer museum. The Centre for Computing History houses a large collection of vintage hardware, and maintains much of it in a running condition ready for visitors to experiment with. Finding the museum is easy enough if you are prepared to trust your mapping application. It’s a reasonable walk from the centre of the city, or for those brave enough to pit themselves against Cambridge’s notorious congestion there is limited on-site parking. You find yourself winding through an industrial park past tile warehouses, car-parts shops, and a hand car wash, before an unobtrusive sign next to a railway level crossing directs you to the right down the side of a taxi company. In front of you then is the museum, in a large industrial unit. Pay your entrance fee at the desk, Gift Aid it using their retro green screen terminal application if you are a British taxpayer, and you’re straight into the exhibits. Right in front of you surrounding the café area is something you may have heard of if you are a Hackaday reader, a relatively recent addition to the museum, the Megaprocessor. If we hadn’t already covered it in some detail, the Megaprocessor would be enough for a long Hackaday article in its own right. It’s a 16-bit processor implemented using discrete components, around 42,300 transistors and a LOT of indicator LEDs, all arranged on small PCBs laid out in a series of large frames with clear annotations showing the different functions. There is a whopping 256 bytes of RAM, and its clock speed is measured in the KHz. It is the creation of [James Newman], and his demonstration running for visitors to try is a game of Tetris using the LED indicators on the RAM as a display. To be able to get so up close and personal with the inner workings of a computer is something few who haven’t seen the Megaprocessor will have experienced. There are other computers with lights indicating their innermost secrets such as the Harwell Dekatron, but only the Megaprocessor has such a clear explanation and block diagram of every component alongside all those LED indicators. When it’s running a game of Tetris it’s difficult to follow what is going on, but given that it also has a single step mode it’s easy to see that this could be a very good way to learn microprocessor internals. The obligatory row of BBC Micros. The first room off the café contains a display of the computers used in British education during the 1980s. There is as you might expect a classroom’s worth of Acorn BBC Micros such as you would have seen in many schools of that era, but alongside them are some rarer exhibits. The Research Machines 380Z, for example, an impressively specified Z80-based system from Oxford that might not have the fame of its beige plastic rival, but that unlike the Acorn was the product of a company that survives in the education market to this day. And an early Acorn Archimedes, a computer which though you may not find it familiar you will certainly have heard of the processor that it debuted. Clue: The “A” in “ARM” originaly stood for “Acorn”. The LaserDisc system, one you won’t have at home. The rarest exhibit in this froom though concerns another BBC Micro, this time the extended Master System. Hooked up to it is an unusual mass storage peripheral that was produced in small numbers only for this specific application, a Philips LaserDisc drive. This is one of very few surviving functional Domesday Project systems, an ambitious undertaking from 1986 to mark the anniversary of the Norman Domesday Book in which the public gathered multimedia information to be released on this LaserDisc application. Because of the rarity of the hardware this huge effort swiftly became abandonware, and its data was only saved for posterity in the last decade. The main body of the building houses the bulk of the collection. Because this is a huge industrial space, the effect is somewhat overwhelming, as though the areas are broken up by some partitions you are immediately faced with a huge variety of old computer hardware. The largest part of the hall features the museum’s display of home computers from the 1980s and early 1990s. On show is a very impressive collection of 8-bit and 16-bit micros, including all the ones we’d heard of and even a few we hadn’t. Most of them are working, turned on, and ready to go, and in a lot of cases their programming manual is alongside ready for the visitor to sit down and try their hand at a little BASIC. There are so many that listing them would result in a huge body of text, so perhaps our best bet instead is to treat you to a slideshow (click, click). Definitely not Pong, oh no. Beyond the home micros, past the fascinating peek into the museum’s loading bay, and there are a selection of arcade cabinets and then a comprehensive array of games consoles. 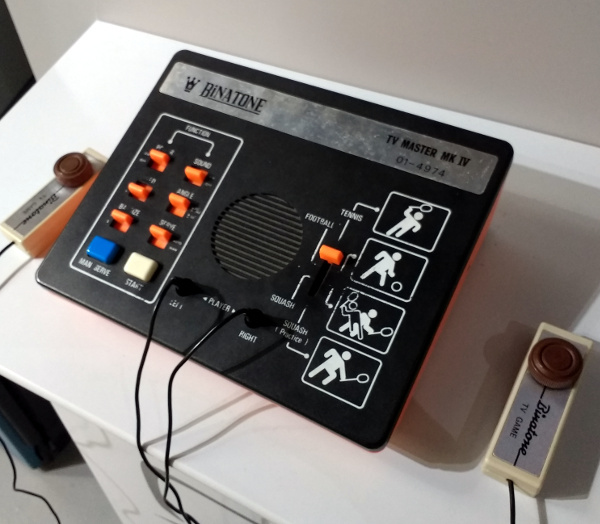 Everything from the earliest Pong clones to the latest high-powered machines with which you will no doubt be familiar is represented, so if you are of the console generation and the array of home computers left you unimpressed, this section should have you playing in no time. One might be tempted so far to believe that the point of this museum is to chart computers as consumer devices and in popular culture, but as you reach the back of the hall the other face of the collection comes to the fore. Business and scientific computing is well-represented, with displays of word processors, minicomputers, workstations, and portable computing. On a pedestal in a Perspex box all of its own is something rather special, a MITS Altair 8800, and a rare example for UK visitors of the first commercially available microcomputer. Famously its first programming language was Microsoft BASIC, this machine can claim to be that from which much of what we have today took its start. In the corner of the building is a small room set up as an office of the 1970s, a sea of wood-effect Formica with a black-and-white TV playing period BBC news reports. They encourage you to investigate the desks as well as the wordprocessor, telephone, acoustic coupler, answering machine and other period items. 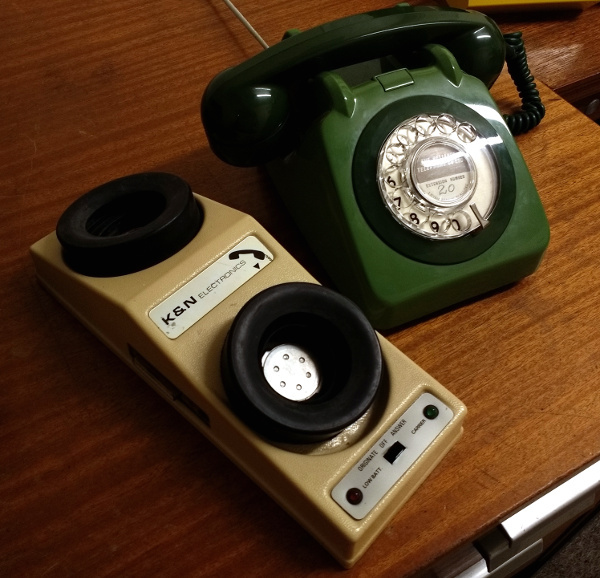 UK phone aficionados would probably point out that office phones were rarely anything but black. The museum has a small display of minicomputers, with plenty of blinkenlight panels to investigate even if they’re not blinking. On the day of our visit one of them had an engineer deep in its internals working on it, so while none of them were running it seems that they are not just static exhibits. Finally, at various points around the museum were cabinets with collections of related items. Calculators, Clive Sinclair’s miniature televisions, or the evolution of the mobile phone. It is these subsidiary displays that add the cherry to the cake in a museum like this one, for they are much more ephemeral than many of the computers. This is one of those museums with so many fascinating exhibits that it is difficult to convey the breadth of its collection in the space afforded by a Hackaday article. 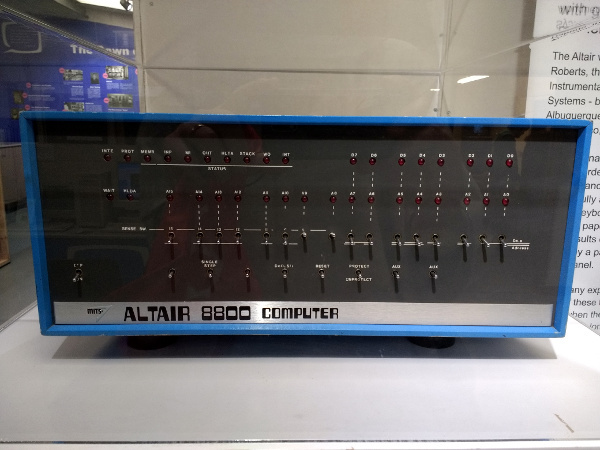 There is an inevitable comparison to be made between this museum and the National Museum of Computing at Bletchley Park that we reviewed last year. It’s probably best to say that the two museums each have their own flavours, while Bletchley has more early machines such as WITCH or their Colossus replica as well as minis and mainframes, the Centre for Computing History has many more microcomputers as well as by our judgement more computers in a running and usable condition. We would never suggest a one-or-the-other decision, instead visit both. You won’t regret it. The Centre for Computing History can be found at Rene Court, Coldhams Road, Cambridge, CB1 3EW. They are open five days a week from Wednesday through to Sunday, and seven days a week during school holidays. They open their doors at 10 am and close at 5 pm, with last admissions at 4 pm. Entry is £8 for grown-ups, and £6 for under-16s. Under-5s are free. If you do visit and you are a UK tax payer, please take a moment to do the gift aid thing, they are after all a charity. It’s not history if you remember it. How devastated was my mate when his daughter came home from school having studied hippies, he was still living it. 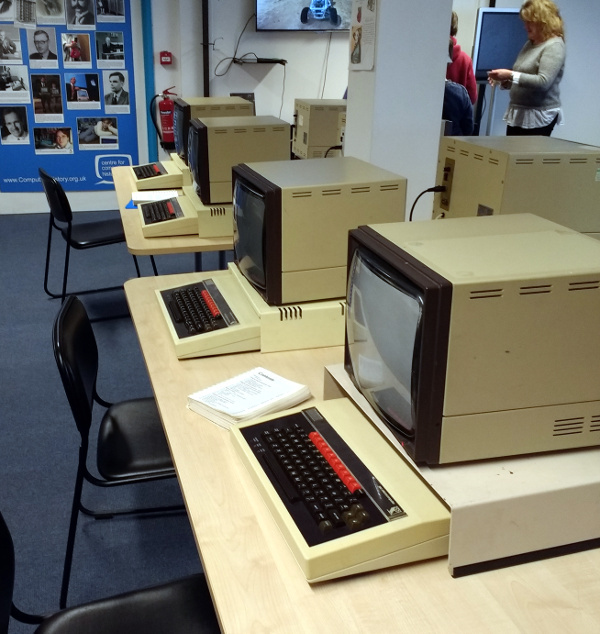 I think Britain needs a Vintage Computing Festival…. and now I know just where it should be hosted! Yes at the National Museum of Computing in Bletchly, The Centre for Computing History is good but Bletchly is better, especially as they have rooms for events. Us folk around here are a bit proud of that. It’s a great place to go to visit, if you have a couple of hours to spare in Cambridge. Can I bring my old programs printed on fanfold and key them in? I would probably lose at least half the day sitting at an AS/400 console. Checks the catalogue – alas, no, they’re RS6000 – AIX (unix) boxes. Still fun. RS6000 are old? Jeez. I was at uni when they replaced the pair of Orion mainframes with a single RS6000. In the US we have Living Computers Museum + Labs in Seattle. Supercomputers, mainframes, minicomputer and micros all running and available to use! Not anyone, you mean Windows users. Ooh. I think I’ll go to that! I’ve been there and I found it quite interesting. “The LaserDisc system, one you won’t have at home” not wishing to gloat Jenny but I have 2 of them. I have a Doomsday system as well. There were quite a few made probably a hundreds rather than thousands, but obviously over time many got thrown out when schools got new updated computer systems. Impressed that HaD readers deliver the goods! :) I’d quite like the chance to peer inside and write a feature. My laserdisc player is now on the workbench to be fixed after somebody mentioned on a earlier HaD article comment that they had a backup battery inside that leaks. Fortunately mine hadn’t leaked, and infact still had a charge and recharged, impressive for a NiCad after at least 10 years of disuse. But the player has other issues, it takes a disc but doesn’t spin it up, and then won’t eject the disc again. First task was to make some riser cards for the DIN 41612 Connectors so I can raise the control board out of the depths of the machine and get a scope onto it. Watch out for laundry at that crossing. Don’t get tangled up in shirts and pants. Knickers! The 1980s and 1990s were definitely the Golden Years of Philips CRTs. Most of the monitors in that slide show are Philips, or OEMs of Philips. Needless to say, the factory in the Netherlands that made those CRT’s doesn’t exist anymore, it was torn down a few years ago. Stuart Ashen on YouTube has made several videos about this place. As an Internet celebrity, they let him poke through the cardboard boxes in their storerooms and look at the things they haven’t room to display. Some of it is astonishingly obscure.